This is a great op-ed by Cuban-American actor/writer/filmmaker Natalie Morales (Lucy on Parks and Recreation, Claire on The Grinder). Screen shot of Flood Magazine. Photo by Sean Mennie. 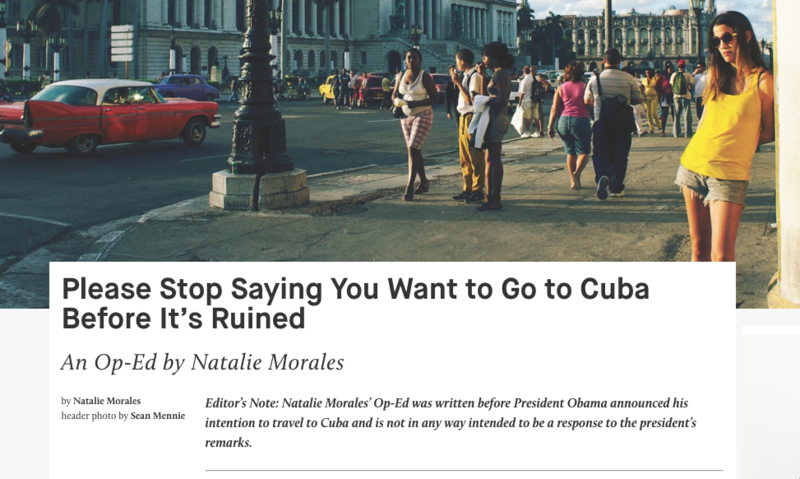 First, read her well-written essay (published by Flood Magazine) on her family’s experience in Cuba: Please Stop Saying You Want to Go to Cuba Before It’s Ruined. Confession — I’ve said that many times. I probably didn’t use the words “before it’s ruined,” but my meaning was close enough. I’ve also been guilty in the past of wanting quaint places to stay quaint — as if they exist purely for my own enjoyment, rather than as places where real people live their real lives. My thinking has evolved over the years, and probably could stand to evolve even more. Another lament I’ve heard many times among the adventure travel set: “This place just doesn’t feel authentic anymore.” That usually refers to something like a McDonald’s appearing in the heart of a colonial town square. There are likely legitimate gripes about that McDonald’s — especially if its existence is threatening the livelihood of a family-run enterprise that’s been on the corner for generations. But who gives me, a visitor, the right to say what’s authentic in someone else’s town? And, by the way, that lovely colonial square isn’t authentic, either. It was forced on earlier inhabitants by, duh, the colonists. From my experience, these types of remarks are common among us first-world travelers who like to think of ourselves as adventurers. We love the idea of escaping the comforts and commercialism of our worlds. That’s why I fantasized about visiting Cuba. It seemed like one of the few remaining places where you would not encounter a McDonald’s. Also, since it’s been illegal for Americans to go, sneaking in and out becomes a point of pride, a sort of proof-of-life-as-an-adventurer. There’s nothing wrong with wanting to escape our own cultures. In fact, I would argue it should be a mandatory experience for every citizen. But it’s all-too-easy to fall into a mindset that other places need to meet our own expectations of what those other places are supposed to be. And then to feel let down if they’re not. This is not only arrogant, it robs us of experiencing what a place is really like — McDonald’s and all — because we’re too busy looking for what we have decided we’re supposed to see. Over the years I’ve mellowed a bit in that regard. I can sometimes catch myself now when I start to compare a place to the fantasies in my head. Natalie’s article is another great reminder. The view from our apartment in Quito. An armed man points his weapon in through the door of the bus I am on and fires indiscriminately. Passengers shriek, duck, then ready their own guns for a counter attack. 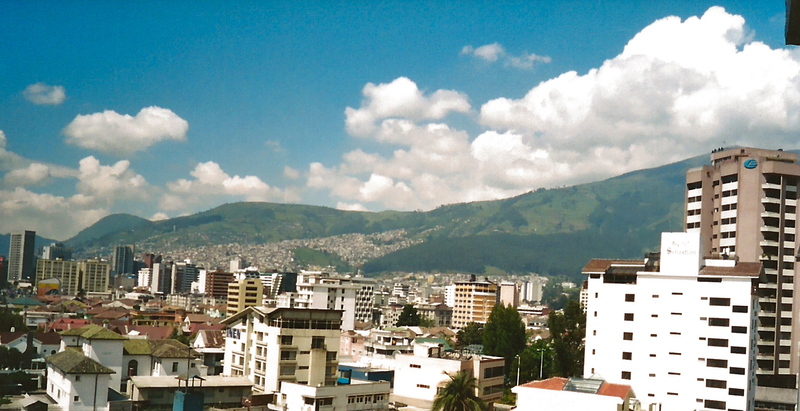 On the streets, children and adults bear arms, and snipers strategically position themselves on rooftops and balconies. Yes, delight. For their ammunition of choice is water — and their artillery takes the form of water machine guns, water-filled balloons and even full buckets poured over the heads of passersby. Their victims are anyone and everyone — friend and stranger — who happen to cross their paths. Their reason: Carnival. The entire country engages in a massive, non-stop water fight for a few weeks leading up to Lent. No one is spared. I was not prepared for this unusual, playful and at times painful ritual. Did I mention the water balloon launched from six stories high that hit me in the head (ouch) as I was walking to my job teaching English to businessmen (showing up wet … um, embarrassing). It’s fun and strange — and sometimes a little disorienting — to encounter another culture’s traditions first-hand. But that’s partly the point. Yet another reason to travel! Have you experienced any surprises on the road? Please share! Efficient, expansive travel requires less, not more. One bag that serves multiple functions. A sarong that's also a towel, blanket or sheet. Clothing layers that pack small and carry light. A daypack with one-reach access to essentials. A pocket for my Chapstick. can make me feel encumbered and anxious. But the lighter I travel the more liberated I feel (as long as my Chapstick and water bottle are within reach). "Less" requires planning. For me, honing the art of traveling light is a journey unto itself. And I STILL haven't found the perfect travel bag. Wanna see the real city? Hang with a local. The content on this site is based on the personal experiences of an OCD-positive traveler. It is not medical advice. If you think you suffer from anxiety, seek the counsel of a medical professional. Believe me, it helps. Copyright 2012-2014. All rights reserved.